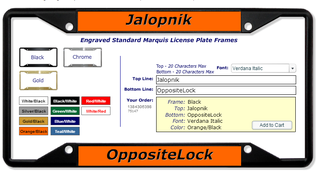 Anyone Make or Own an Oppo License Plate Frame? Maybe something similar to this but with actual logos. I know we have the stickers; heck I have one already! But I'd love a frame since I currently have the stock dealer one... I think it'd be cool. UPDATE: I made one with proper logos! (again very rough draft) and on brushed aluminum!